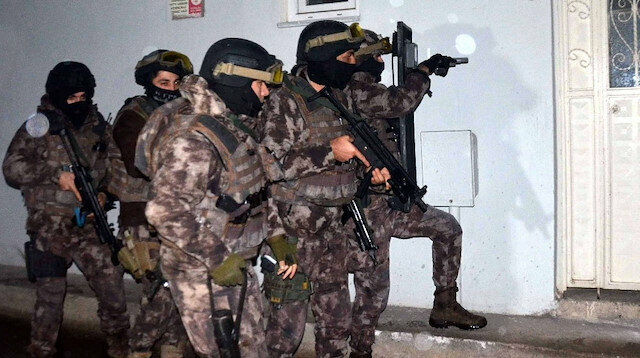 Turkish police arrested 23 suspects in separate operations against the Daesh terrorist group on Wednesday. Anti-terror operations were conducted across three cities to arrest suspects, who were reportedly operating on behalf of Daesh. At least 14 foreign national Daesh suspects who entered the country illegally were held by security forces in the capital, Ankara. The suspects were reportedly operating for the terror group in Syria and Iraq. Separately, eight Daesh suspects were arrested in the Aegean province of Izmir. The Police also captured a woman sought by the Interpol on a ‘red notice’, for her alleged link to the terror group in the northwestern Bursa province. More than 300 people have lost their lives in Daesh-claimed attacks in Turkey, where the terror organization has targeted civilians in suicide bombs, rocket and gun attacks. Turkish security forces have been involved in a long-running campaign to thwart Daesh activities. The conflict between Turkey and ISIS is an ongoing series of clashes as part of the spillover of the Syrian Civil War. Turkey has an active war with ISIL. ISIL is suspected of being involved in or responsible for multiple terrorist attacks on Turkish soil. Some of them are the ones which took place in May 2013 in Reyhanlı and March 2014 on Turkish police. Others constitute the June 2015 attack, namely the Diyarbakır rally bombing and the most notable was the 20 July 2015 Suruç bombing which resulted in the killing of 33 young Kurdish activists. This attack triggered the third phase of the Kurdish–Turkish conflict which was ongoing since 1978 and reignited fighting amongst Turkish security forces and the PKK. In 2014, Turkey attacked ISIL and later joined a US-led coalition ‘to fight ISIL’. Since 2015, Turkey has been trying to push back ISIL, which also led ISIL upping the rhetoric against the Turkish government. In the meantime, the Turkish authorities have arrested around 1,200 people inside Turkey through the past year for suspected links with ISIL. The next step the Counter-terrorist agencies will take after arresting such a huge number of persons, most of who may be terrorists, is painstakingly interrogate them while conducting extensive investigations. The agencies need a tool to speed up this process, Additionally, they need the capability to quickly screen asylum seekers and refugees to detect active terrorists in guise and members of sleeper cells. Modern science can provide a tool which is powerful enough to find out if a person has had any sort of terror influence in the form of brainwashing or exposure to propaganda. Such a tool must go beyond screening and help the agencies to understand the structure of the group. Conventional methods employed by investigative agencies are not quite effective in screening suspects and discovering terrorists among innocents. Traditional methods used by law enforcement and anti-terror agencies prove to be costly and time-consuming, in addition to being resource intensive. They are thus, inadequate while dealing with terrorist groups like the ISIS. Turkish counter-terrorism agencies require a contemporary tool which can help screen and identify those persons who have terrorist training, exposure to terror propaganda, cognizance of terror plans, part of sleeper cells, etc. A tool which can help pinpoint the people who fund terror or help brainwash and train the recruits, etc will be greatly appreciated. Counter-terrorism organizations will be delighted to of technology which can discover the presence of crime-specific information in the minds of arrested suspects, and help nab terrorists before they carry out their ‘mission’. iCognative developed and designed by Brainwave Science is a modern forensic technology which is not only portable but also simple and straightforward to use and learn. It promises over 99% accuracy and results within an hour. iCognative is a technology which can identify a terrorist or the member of a sleeper-cell among the suspects. iCognative solves a basic problem faced by counterterrorism officials, differentiating between terrorists and innocents, before the terrorists’ strike. The iCognative system looks for the existence of crime-related and specific information stored in the brains of the subjects. Information related to terror or crime would only be present in the brain of a person who is involved in terror activities. By screening terrorists, the counter-terrorism agencies can be ahead of the terrorists. The information stored in the brains of the terrorists can be used to reverse-engineer the organization and help reach the top bosses. Terrorist networks rely on funding from sympathizers to fulfil their terror agenda. iCognative can help security forces to identify and eliminate the terrorist leaders, rather than fighting the foot soldiers of such a vast terrorist organization. In the case of the arrest of the 23 terrorists, plenty of stimuli can be used for conducting the iCognative test. The images, words and phrases linked to terror incidents can be used as stimuli or input. The investigator tests the subject for the awareness of information such as awareness of specific details of related terror incidences, level of awareness of the seized weapons, propaganda material, bomb-making material etc. Also, details of bomb-making knowledge, financial information, links to radical followers can also be added to the iCognative system by the investigator. The iCognative system records and analyzes the brain responses of the suspect to determine with over 99% accuracy whether specific crime-related information under question is present in the suspect’s brain or not. iCognative can help greatly in matters of National Security and Counter-terrorism. By adopting iCognative by Brainwave Science, Turkish authorities can be better equipped to weed out terror. The Turkish government can now make use of a tool which can help end this menace of terrorism in a cost-effective and scientific manner.